1.Stock Gave a Good Horizontal Resistance breakout after 3 year. 2.Stock is Trading above 100/200 Moving Avg. 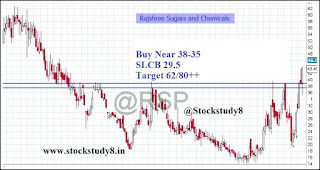 3.If stock is manage to hold 30-29 level then we can see 62/80. Once SLHIT Exit From the Stock. Or If 1st Tgt hit Trail ur SL to cost for second Tgt.